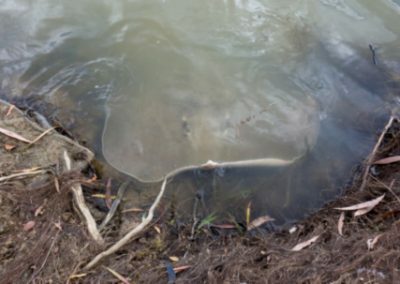 When I first applied to volunteer with Sharks and Rays Australia (SARA) on a sawfish expedition, I was mostly thinking that it would be a fantastic opportunity to get some more field research experience and learn more about other elasmobranchs I haven’t had any/much contact with. While this proved to be true and absolutely valuable, it was so much more than that. So what else was it? What was so fantastic? Just off the top of my head…. helping a dedicated researcher and her organisation conduct necessary research on the whereabouts of a rapidly diminishing species, educating the local school children on the effects of depleting any part of the food chain, gaining experience in remote area operations, gaining an insight into indigenous culture in their amazing surroundings and how they interact with it, exploring the fascinating region of the inland Gulf of Carpentaria and the insane amount of wildlife that inhabits it, making friends with other like minded people in various related industries, and enjoying the absolute serenity of camping in a remote area…Obviously I had a fantastic time, so much that I would very much like to return, as soon as I can. On the research side of things, we had great success. 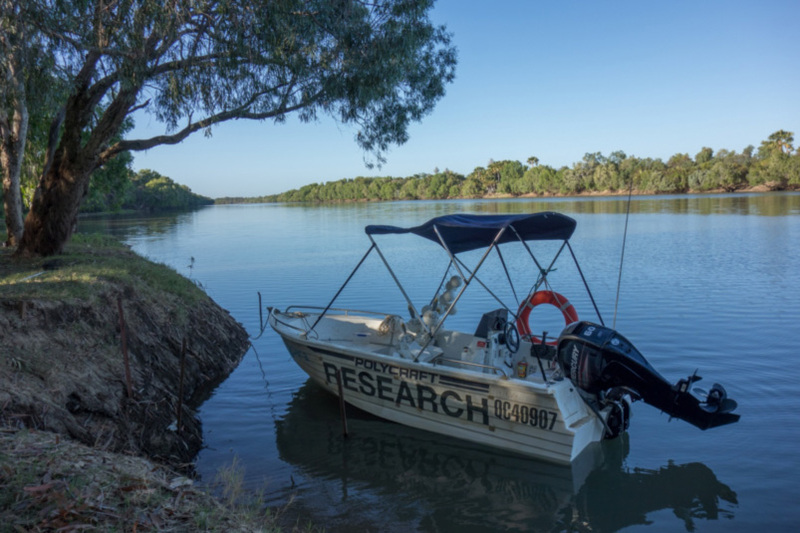 We sampled mostly in a part of the Mitchell River near Kowanyama. 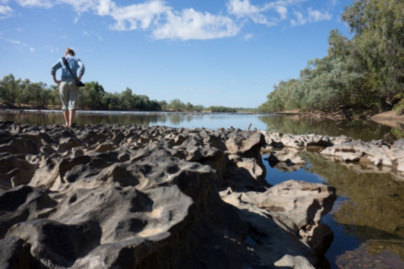 Barbara was very excited to sample this area as it is a place that she is currently only able to sample once a year, and has a large area of river systems. We used a combination of gillnetting and drum lining from the boat and hand lining from the riverbank. We were extremely happy to confirm the presence of sawfish in this area, catching two specimens, one of which was a juvenile male, and the other an adult female (which was very sadly sawless). It was heartbreaking to see this sawless specimen as she appeared very malnourished, a likely result of losing her main hunting tool by a fisherman wanting a trophy. Nevertheless, it was great to see her alive and we hoped that she would adapt to sawless life soon and as best as she could. I’m also quite sure that Barbara will be using the images of this animal to raise more awareness of this terrible practice and educate fisherman on the consequences of this action. 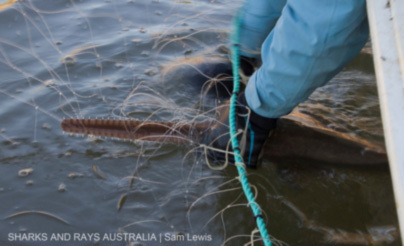 Preparing to release the sawless adult female sawfish on a sunset hand lining session, with the help of a fellow camper/fisherman. Apart from the presence of sawfish (an enormous win! 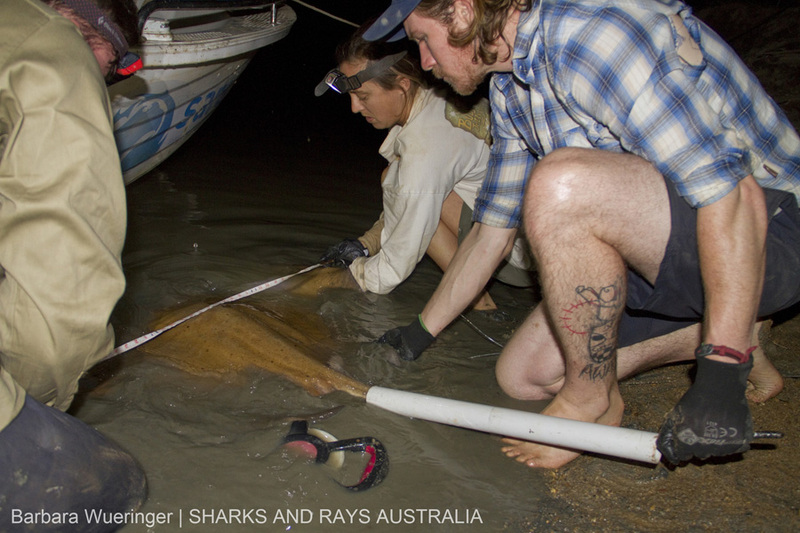 ), we were also glad to confirm the presence of bull sharks with a juvenile male bull shark. We also confirmed a hotspot for Freshwater Whiprays, working up 7 of these in a short space of time. These freshwater whiprays stole a few hearts with their extremely adorable and dextrous snouts! The work up depended on the animal, but usually consisted of measurements, species ID, sexing, taking biopsies and DNA samples, dart tagging and/or PIT tagging, photographing the animal, and releasing it safely. Having quite a small team, we were all able to rotate positions and have the chance to perform the entire variety of roles during the workup, and Barbara was a very passionate and strong leader. Usually the person taking care of photography would also be recording the details of the animal on the data sheet, and assisting the team with anything else they required. Any additional features or notes on the animal were recorded also, along with the fishing method, location, time etc. In between fishing, we had many things to do, such as helping to fix gillnets (ok I was terrible at it), cleaning equipment , cooking or preparing food, filling water bottles and water buckets, getting the fire going, re-rigging the fishing lines, maintaining the camp toilet, and sometimes a spare moment to relax and cool off with a refreshing bucket shower. The whole trip functioned as a great team exercise, and each member brought their own skills to the expedition. During the entire expedition we were lucky enough to see an extensive array of wildlife. The amount of bird species we saw was unbelievable. 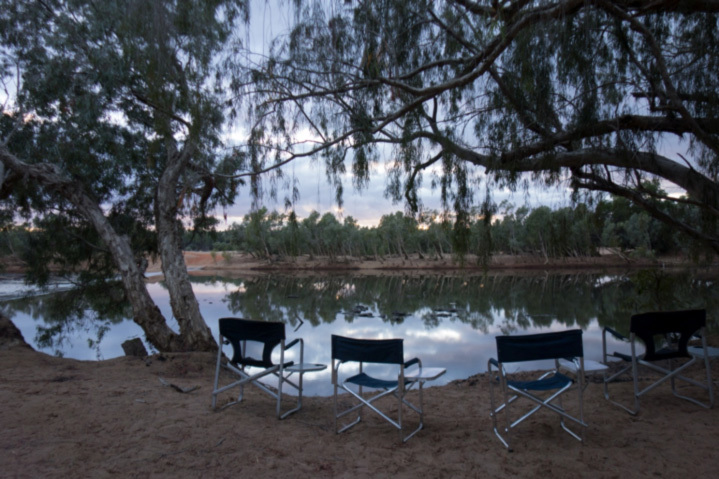 We marvelled at the beautiful Jabiru, the multitude of birds of prey, Barbara even saw her first echidna, and we watched eagerly the shining eyes of crocs in the river at night. 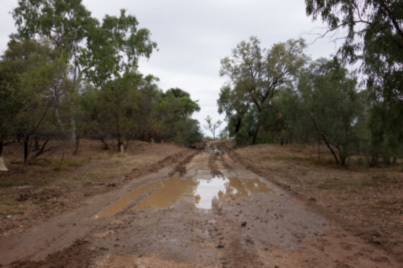 During the trip we were careful in selecting camp sites that were most safe from crocs. We analysed the height of the banks, areas of access to crocodiles, tracks, barricades, and distances to our swags. While working up an animal on the banks, we used the boat for protection and kept a watchful eye that we were adequately protected. 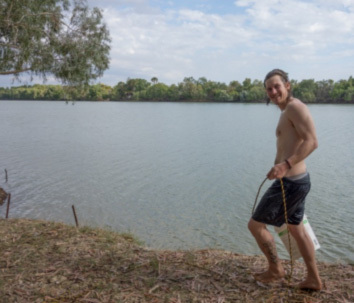 Although we mainly saw freshwater crocodiles, which are said to be not as dangerous, we did sight at least one that we believed to be a saltwater crocodile. Each time we sighted a crocodile the team was in awe..They really are such an amazing prehistoric creature. Later at night and in the early morning darkness it was particularly exciting, for me at least! On the way home, we stopped and sampled some other very interesting locations. It was great to explore other regions that could possibly be sampled further in future expeditions. Again we were treated to more wildlife and some stunning scenes of nature. It was impressive to imagine and then witness the logistics and organisation involved in a SARA expedition and I must admit I have the utmost respect for Barbara in what she has worked hard to establish. 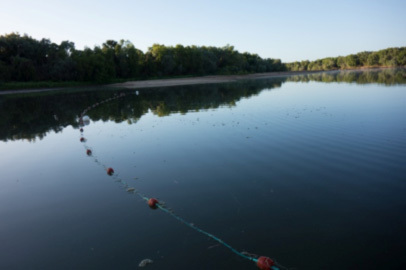 It’s quite an operation to drive a troop carrier or two, towing a packed boat and trailer to a very remote location and conduct hands-on research with a team of volunteers for 11 days! 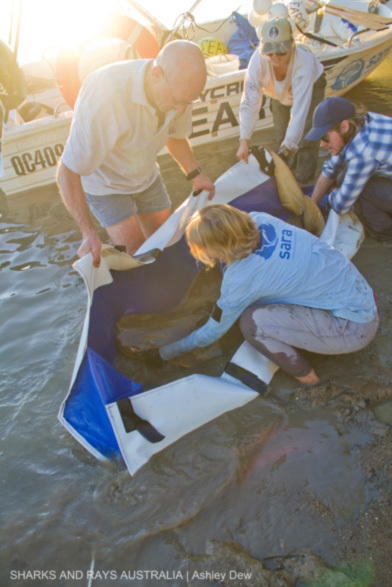 Barbara (and SARA) is involved in many aspects of shark and ray conservation, and I look forward to seeing what unfolds in the coming years as a result of her research and dedication. 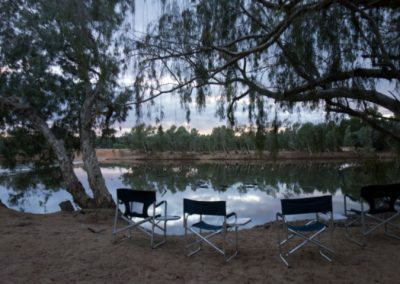 The whole 11 days was an absolute adventure: the excitement of checking the nets and lines, the four wheel driving, trouble shooting, problem solving, sharing laughter/ information/stories while on the boat or around the fire, tropical downpours, cast net practice, damper making, delicious campfire meals, the serenity, outback stargazing, making friends with fisherman and fellow campers, all of it was an absolute pleasure! I would recommend it to any adventurous spirits or budding scientists who are interested in the research or conservation of this amazing animal. Fun and challenging road conditions! 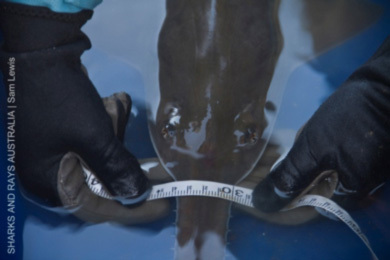 Above, Team Leader Assistant Rebecca measures a freshwater whipray. thank you for all your help, Re!